Are You Riding the Snow Drifts? With all the snow we get here in Michigan, many people like to go snowmobiling for fun! There are clubs and groups, training classes and whole associations dedicated to snowmobiling in Michigan. It’s a great way to meet new people and have some winter fun, but snowmobiling can be dangerous as well. 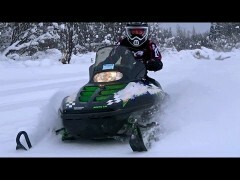 According to trustedchoice.com, almost 14,000 people get injured when snowmobiling in North America alone. To stay safe while riding, start with the proper apparel. High quality gloves, boots, jackets, and helmets are vital to your safety on the trails. Pack safety materials like food and fire starters in case you get stranded. Keep a tool kit and a first aid kit on your vehicle to keep yourself and your vehicle running smoothly. It is a good idea to take a CPR course before going out on the trails. You could save a friend’s life! Be sure to learn the proper signals for riding in a group. These can help you avoid a dangerous collision. Take a class on snowmobile safety before driving one. This will teach you about emergency situations, proper etiquette, and could save your life and the lives of those around you.